Gerrit Code Review <gerrit@wikimedia.org> committed rEIDS7b128a23b28d: Final NoteDb migration updates (authored by Filip). Gerrit Code Review <gerrit@wikimedia.org> committed rEIDSc79047b91e78: Update patch set 5 (authored by Filip). Gerrit Code Review <gerrit@wikimedia.org> committed rEIDSd6427363d543: Create patch set 5 (authored by Filip). Gerrit Code Review <gerrit@wikimedia.org> committed rEIDS19ef317255c7: Update patch set 4 (authored by Filip). Gerrit Code Review <gerrit@wikimedia.org> committed rEIDS74a305be0707: Update patch set 3 (authored by Filip). Gerrit Code Review <gerrit@wikimedia.org> committed rEIDS26cf1c931381: Create patch set 4 (authored by Filip). Gerrit Code Review <gerrit@wikimedia.org> committed rEIDScdae8318ef86: Create patch set 3 (authored by Filip). Gerrit Code Review <gerrit@wikimedia.org> committed rEIDSdf1dca051625: Create patch set 2 (authored by Filip). Gerrit Code Review <gerrit@wikimedia.org> committed rEIDS11b54fbc527e: Update patch set 1 (authored by Filip). Gerrit Code Review <gerrit@wikimedia.org> committed rEIDS080db0903606: Create change (authored by Filip). Gerrit Code Review <gerrit@wikimedia.org> committed rEIDS40731ec6c3aa: Update patch set 1 (authored by Filip). Gerrit Code Review <gerrit@wikimedia.org> committed rEIDSeb86e65adf03: Create change (authored by Filip). Gerrit Code Review <gerrit@wikimedia.org> committed rEPFM870665b6154a: Final NoteDb migration updates (authored by Filip). Gerrit Code Review <gerrit@wikimedia.org> committed rEPFMc87b05f2432d: Create change (authored by Filip). Gerrit Code Review <gerrit@wikimedia.org> committed rEBSES08d1b1f5451d: Update patch set 4 (authored by Filip). Filip added a comment to T156430: VoteNY doesn't round off votes early enough and results in long decimals. Filip added a comment to T179342: When searching "My lists" or "History", whitespace should be trimmed..
Filip moved T156430: VoteNY doesn't round off votes early enough and results in long decimals from Proposed tasks to Imported in GCI Site on the Google-Code-in-2017 board. Added this task to GCI board. Filip updated subscribers of T156430: VoteNY doesn't round off votes early enough and results in long decimals. Filip added a project to T156430: VoteNY doesn't round off votes early enough and results in long decimals: Google-Code-in-2017. Hmm, looks like the problem is in Vote.class.php. number_format should do the job. Filip closed T148006: Wrong "Log in" link title on private wiki as Resolved. Filip updated the task description for T160444: @notify command should be able to take more than one argument. Filip created T160444: @notify command should be able to take more than one argument. Filip placed T157881: Rewrite OO.ui.prompt to extend MessageDialog up for grabs. Not blocking it, don't have time to finish it for now. Filip removed a project from T34950: Use jQuery.suggestions to add reason suggestions to block/delete/protect forms: Patch-For-Review. Filip added a comment to T156304: Convert flag reason form in QuizGame/PictureGame too OOjsUI dialog. .
• Qgil awarded T154383: Autoconfirmed users with `newsletter-create` right can move newsletters a Barnstar token. Filip created T157969: Improve logging of PictureGame extension..
Filip claimed T157881: Rewrite OO.ui.prompt to extend MessageDialog. Filip updated subscribers of T157881: Rewrite OO.ui.prompt to extend MessageDialog. Filip created T157881: Rewrite OO.ui.prompt to extend MessageDialog. Filip placed T157449: Use UserMultiSelect widget for managing subscribers of newsletter. up for grabs. Filip added a comment to T157449: Use UserMultiSelect widget for managing subscribers of newsletter..
Filip updated subscribers of T157449: Use UserMultiSelect widget for managing subscribers of newsletter..
Filip created T157449: Use UserMultiSelect widget for managing subscribers of newsletter..
• Qgil awarded T154384: "View Source" link appears as "Edit" for autoconfirmed users (who cannot edit newsletters) a Like token. Filip closed T154384: "View Source" link appears as "Edit" for autoconfirmed users (who cannot edit newsletters) as Resolved. Filip closed T156833: Reason feature is not working in Quiz Game extension as Resolved. Filip added a comment to T155327: Consider merging QuizGame, PictureGame, and PollNY extensions together . @SamanthaNguyen: PollNY its a bit diffrent extension - Lets merge -games first. @SamanthaNguyen: Thats exactly what I wanted to do. Great! Maybe, instead of doing patches for QuizGame - lets make git repo for it / Thats a big change, working on it in git pull requests would be helpful. @SamanthaNguyen : I have an idea. Maybe lets merge PictureGame into QuizGame? QuizGame have better code, it uses api instead of calls to special page, etc. Maybe, we will just have to choose between 'Create Quiz question', and 'Create Picture question'? Will create git repo, and post my WIP in the future. Filip claimed T156833: Reason feature is not working in Quiz Game extension. Filip reopened T156833: Reason feature is not working in Quiz Game extension as "Open". @SamanthaNguyen: Compare both patches. This is not a fix for it. Filip added a comment to T155451: PictureGame should allow for entering a reason when flagging a picture game. @SamanthaNguyen: Implemented this - just need to make update sql scripts. 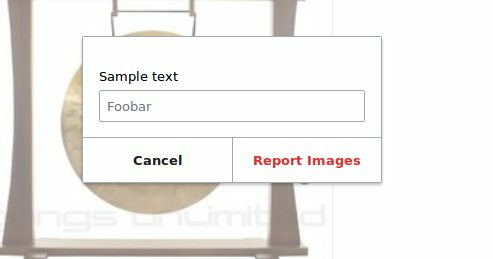 Sending screenshots of admin panel - with provided reason, and without it. Filip created T156833: Reason feature is not working in Quiz Game extension. 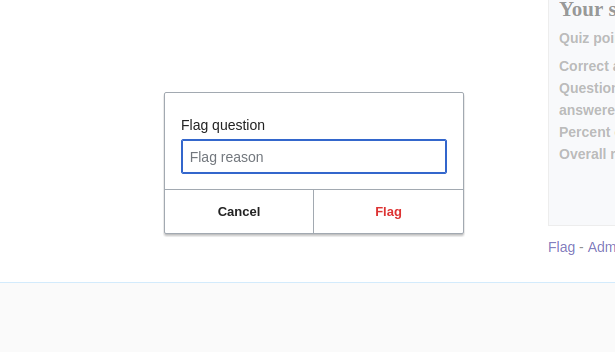 Filip created T156363: Phabricator rename request..
SamanthaNguyen awarded T156304: Convert flag reason form in QuizGame/PictureGame too OOjsUI dialog. a Love token. Filip created T156304: Convert flag reason form in QuizGame/PictureGame too OOjsUI dialog. .
Filip claimed T155451: PictureGame should allow for entering a reason when flagging a picture game. Filip closed T155405: Provide clear error message when SocialProfile extension is not installed. as Resolved. Filip added a comment to T155405: Provide clear error message when SocialProfile extension is not installed..
@ashley: @SamanthaNguyen: Patch provides error message in new page, using ErrorPageError. Will provide screenshots, when i'll have access to my setup. Filip added a comment to T146000: Convert instances of the social tools TagCloud class in FanBoxes and BlogPage to use CapsuleMultiselectWidget. @SamanthaNguyen: Yes, we will wait with this. We don't want to have mixed pure html/ooui interface. Filip removed a project from T17000: Special:Import error: "Import failed: Could not open import file": Google-Code-In-2016. Filip removed a watcher for Social-Tools: Filip. Filip added a comment to T112434: PHP alias-related notices are being thrown for social tools specials. PHP Notice: Did not find alias for special page 'CreateBlogPost'. Perhaps no aliases are defined for it? @SamanthaNguyen @ashley: Working on solution using 'CapsuleMultiselectWidget'. If we're converting this extension to OOjsUI, this will be better solution. Filip claimed T146000: Convert instances of the social tools TagCloud class in FanBoxes and BlogPage to use CapsuleMultiselectWidget. Will take a look on it. @SamanthaNguyen: @ashley: Hmm, why do not use Jquery suggestions? Filip added a watcher for Social-Tools: Filip. SamanthaNguyen awarded T155405: Provide clear error message when SocialProfile extension is not installed. a Love token. Filip claimed T155405: Provide clear error message when SocialProfile extension is not installed..
Nevermind. Tested this on my setup, and its unrelated to extensions/settings. Missed $wgShowDebug. Filip added a project to T112434: PHP alias-related notices are being thrown for social tools specials: QuizGame. Hmm, looks like its thrown by conflict with extension/mediawiki setting? Also has this problem, cleared LocalSettings.php, and problem disappeared. Need to recreate this again, and find exact extension/mediawiki setting. Appeared in QuizGame. Florian awarded T145728: Clean up ContentHandler deprecated functions and hooks a Love token. Filip added a comment to T34950: Use jQuery.suggestions to add reason suggestions to block/delete/protect forms. @BU_Rob13: Yeah, you're right. Will upload patch for this tomorrow. Setting in option is the best idea for now. Filip created T155839: PictureGame extension does not have i18n documentation files..
Filip added a comment to T155322: PictureGame admin panel: Pressing delete or reinstate should ask for confirmation before performing the action. @SamanthaNguyen : T155324 is resolved - will implement this here now. Filip closed T155324: QuizGame admin panel: Pressing delete or reinstate should ask for confirmation before performing the action as Resolved. @SamanthaNguyen: Only T155324 needs review, and will implement this code here. Filip closed T145728: Clean up ContentHandler deprecated functions and hooks as Resolved. Filip added a comment to T145728: Clean up ContentHandler deprecated functions and hooks. Filip added a comment to T154498: Remove remaining ContentHandler deprecated functions and hooks. @MtDu: Patch got merged - Can you take care of remaining functions? Filip added a comment to T155324: QuizGame admin panel: Pressing delete or reinstate should ask for confirmation before performing the action. @MtDu: Thanks for review, fixed! @SamanthaNguyen @ashley: Updated, needs review. Filip added a comment to T155273: Log in subscription to newsletter activity. @Qgil @01tonythomas Maybe just add user option to choose he/she want to be logged? Filip added a comment to T154763: Subscribe/Unsubscribe newsletter floating dialog disappears too soon. 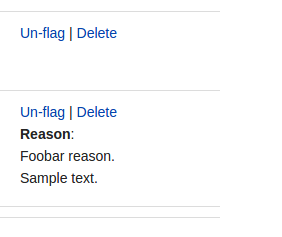 @SamanthaNguyen: Not sure, does "Un-flag", should have constructive flag, or destructive? @SamanthaNguyen : @ashley: Will wait for merge of this patch before adding this to PictureGame. @SamanthaNguyen: Ok, I think its good solution. Filip claimed T155322: PictureGame admin panel: Pressing delete or reinstate should ask for confirmation before performing the action. Filip added a comment to T155448: Fix Main Page opening in Iframe..
Filip created T155448: Fix Main Page opening in Iframe..
Filip removed a watcher for good first bug: Filip. Ok. Decided to use OOjs UI popup. WIll provide patch tomorrow. Filip claimed T154384: "View Source" link appears as "Edit" for autoconfirmed users (who cannot edit newsletters). Pppery: Hmm, thats rare case. Filip added a project to T155405: Provide clear error message when SocialProfile extension is not installed. : good first bug. Is there any mediawiki special page for confirmation? Or create simple special page, with redirect to AJAX action?